In 1990, ÇEKÜL Foundation initiated a long term project named Respect to Sinan that aims to ensure respect and awareness of Mimar Sinan’s architectural heritage and to overcome chronic problems regarding the conservation of Sinan’s architectural heritage. The community foundation established by this project has become the basis for activities aiming to raise public awareness of the architectural legacy and heritage of the country, beginning with the symbolic name “Sinan”. 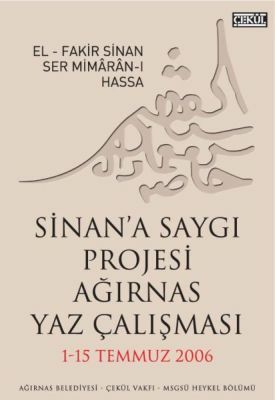 Poster of the Respect to Sinan Project, designed by ÇEKÜL Board member Y. Metin Keskin in 1998. 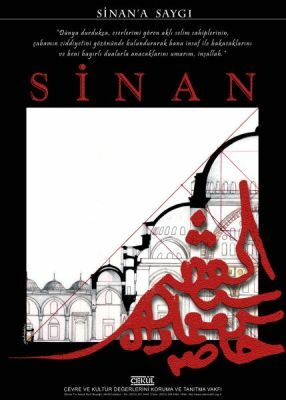 One of the first steps of Respect to Sinan was creating public awareness of Sinan’s works. The initial responsibility of carrying out this task was taken up by ÇEKÜL’s Youth Unit. Respect to Sinan Excursions started with the same aim in 1998 and covered Sinan’s works in both Istanbul and Thrace. The Architect Sinan Inventory Initiative has covered 400 structures as mentioned in the literature and has been completed with the enthusiastic efforts of the ÇEKÜL Youth Unit. This was followed by the collection of information regarding Sinan’s work and photographing and documenting their current conditions. With the help of ÇEKÜL’s regional representatives, the inventory has expanded from Istanbul to Anatolia and Thrace, with aims to expand to cover the entirety of the Middle East. 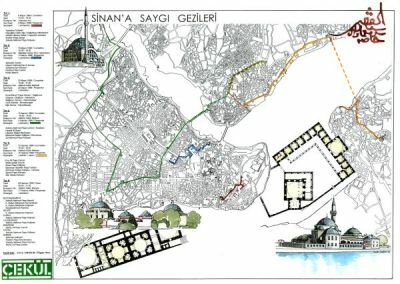 Map for the for the Respect to Sinan Project Tour Organizations, created by ÇEKÜL Board member Y. Metin Keskin in 1998. Sinan’s birth town is the Anatolian village of Ağırnas. In addition to featuring authentic examples of Anatolian stone architecture, the town includes several fountains built by Sinan himself. In 2000, initial steps were taken towards the preservation of Ağırnas’ architectural heritage. 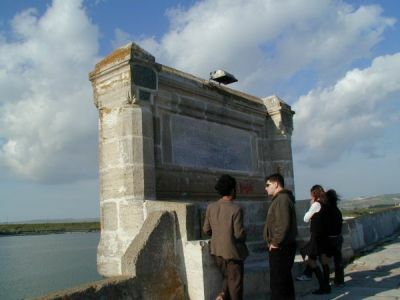 As the first step, a protection plan was formed for Ağırnas which began with the collaboration between the University of Erciyes, the municipality of Ağırnas, and ÇEKÜL Foundation. The main goal of this process was ensuring the protection of the architecture as well as its symbolic/historical value. 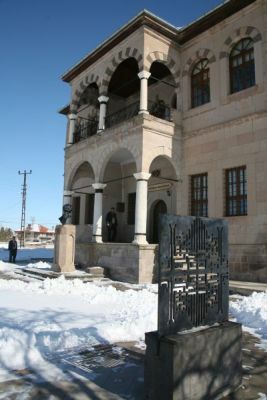 One of the most prominent historical buildings of the village was restored as a municipality and research center for natural, historical, and cultural heritage in Cappadocia (ÇEKÜL’s Cappadocia Regional Coordination Center is also based within this center). Additionally, at the heart of this preservation project lies the Mimar Sinan House Museum. In Ağırnas, the Mimar Sinan House Museum, which is symbolically regarded as Sinan’s birthplace, lies at the heart of preservation efforts. Sinan’s inspiring name is encompassed within preservation projects in Ağırnas along with his fellow citizens. The house museum, which remained empty, ruined, and filled with earth until 2000, was first bought from Sinan’s descendants and transformed into a museum with the generous and devoted efforts of public-civilian-local-private parties. With the vicinity’s rearrangement, the museum was officially opened on April 9th, 2007—the commemoration day of Sinan. The museum is promising to become a dynamic center of activity with a library, archives, exhibition space, rest and meeting rooms and open/semi-open architectural features. Mimar Sinan Museum House, opened in 9 April 2007. Sinan’s works’ Sketch Competition was among the efforts of creating social consciousness of the history and legacy of Mimar Sinan. 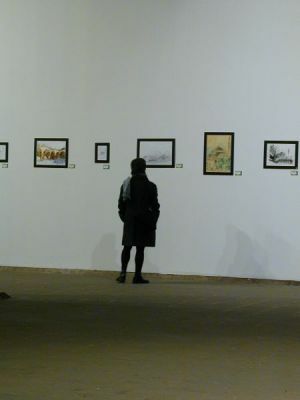 The contest and subsequent exhibitions aimed to make Sinan’s work both visible and acknowledged. Additionally, it helped create a nationwide public consciousness of the historical heritage of Mimar Sinan, both as a historical figure and culturally symbolic name. In all, seventy-five sketches were featured in the competition held between June 15th and September 30th of 2003. All of the contestants’ works were first exhibited in Tophane-i Amire (one of Sinan’s works in Istanbul) and then in the Structure-Industry Center in Harbiye, the Chamber of Architecture in Antalya, Ağırnas, Kayseri, and the Chamber of Architecture in Ankara, respectively. <?xml:namespace prefix = o ns = "urn:schemas-microsoft-com:office:office" />Poster of the Works of Mimar Sinan Sketch Competition, designed by ÇEKÜL Board member Devrim Yaman. 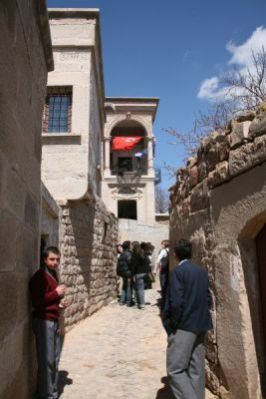 In July 2006, with the collaboration between ÇEKÜL Youth Unit and the University of Architect Sinan’s-Fine Arts Academy/Department of Sculpture, students investigated local architectural values and re-interpreted them in their own works, thereby contributing to the Respect to Sinan project with permanent works of art. Students participated in the Respect to Sinan Excursions in both Istanbul and Thrace. Presentations were held in ÇEKÜL Foundation regarding Sinan’s architecture before students joined the Ağırnas Summer Camp. After the preparation phase in Istanbul, a group of ten students from the Department of Sculpture interpreted Architect Sinan’s perception of architecture with metal and stone sculptures in Ağırnas. The sculptures were completed after fifteen days and were exhibited in the Municipality Square of Ağırnas. In conjunction with the sculpture students, city-planning students from all over the country participated in the Ağırnas Summer Workshop. The results of the workshop formed an infrastructure for the Reconstruction Plan of the Preservation of Ağırnas. The Ağırnas Summer Camp also served as an important milestone in establishing the principle of maintaining social consciousness and collaboration, continuously stated by ÇEKÜL throughout the Respect to Sinan project as an important goal. 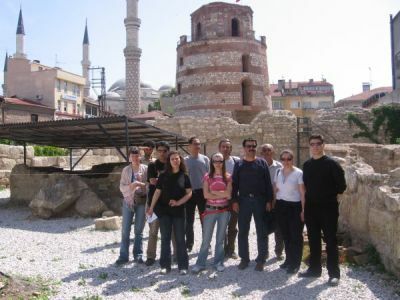 Departments of Architecture, City Planning, History, History of Art, and Archeology from various universities throughout Turkey were especially willing and interested in visiting the area for excursions, summer schools, and other programs; this further helped establish Ağırnas as a cultural, historical, and artistic center. The Respect to Sinan Excursions, which was the first activity of the Respect to Sinan project, gained another dimension in 2006. With the support of ÇEKÜL Regional Representatives, Sinan’s inventory was passed on from Istanbul to Anatolia, Thrace, and overseas. 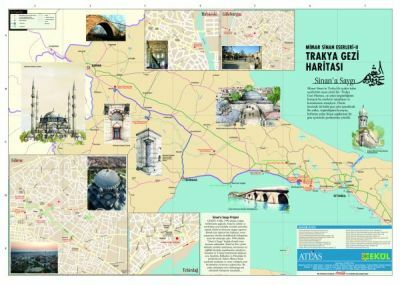 As Sinan’s work started to be systematically photographed and recorded, the fifteen-year experienced Architect Sinan Inventory finally began to develop with the production of excursion maps. 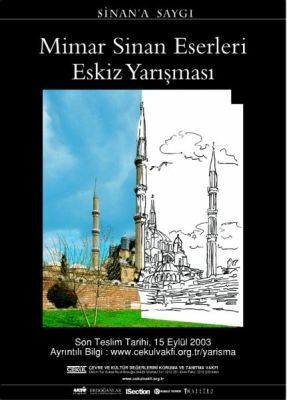 The Architect Sinan’s Work–Istanbul Excursion Map and Architect Sinan’s Work–Thrace Excursion Map were both published in 2007. Back side of the Works of Mimar Sinan Trakia Tour Guide. The webpage www.sinanasaygi.org went live in 2006. This was an important step in the project and acted as both the project’s voice and virtual home of Sinan Excursion Maps. The website provides access to materials including photographs, sketches, and documents, and is expected to expand as visitors add their own contributions to the archives. Upon publication, excursion maps also became available on the site (these maps can be ordered free of charge from the site). After launching in February 2007, the site received 150 visitors per day on average, with a total of over 35,000 hits. The email group created along with the site has become a communication channel and discussion platform for the community. 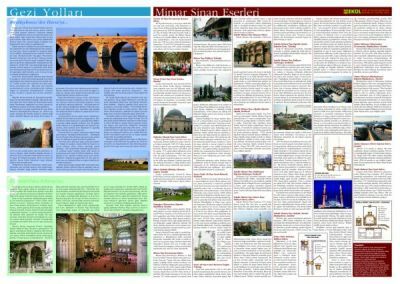 The Respect to Sinan communication group discusses his architectural heritage, contemporary news, knowledge about Sinan’s work, and bibliographic resources. The website is an important milestone and has become an agenda-setting component for the project.